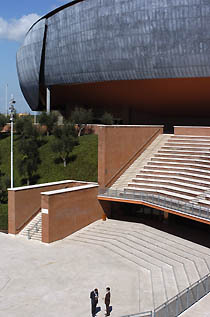 The Parco della Musica is a large public music complex on the north side of Rome, exploiting a spacious site that was part of the 1960 Olympic area. 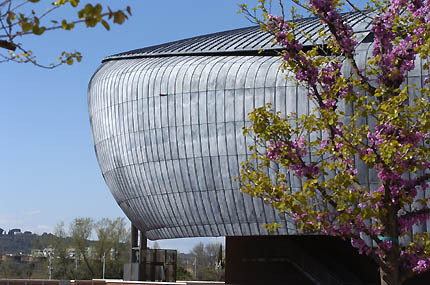 Three large concert halls are built as separate, sound-proofed structures, with a Roman-inspired outdoor theater providing an outdoor venue between them. To complete the unconventional arrangement, an area of Roman ruins, discovered during the building, provides another area of focus for the giant bug-like halls to nestle around. At the front of the complex, a glass-covered arcade of design-restaurant, bookshop and other shops is a Piano trademark (recognizable from both the Nasher and Beyeler galleries). While this frontage bustles during the day, the concept of the overall site as a music "park" seems a little optimistic. The interior public spaces - foyers and exhibition areas - are physically open during the day, but rather forbidding; and the outside park area behind the halls, with playground and grass, is so invisibly round the back that it was deserted on a sunny summer afternoon. Aside from the dramatic, lead-shrouded roofs, the materials are chosen to be traditionally Roman: gracefully-thin red brick, travertine floors (continuous between inside and outside) and orange paint. While this mix is used consistently over most of the complex, the interiors of the three halls, or "music boxes" as Piano calls them, are dominated by bright red seating and dark, American-cherry wood paneling. 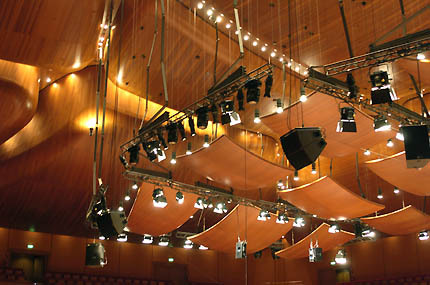 Many claims are made for the acoustic properties of the three halls, achieved through the "natural acoustic" of the materials chosen. 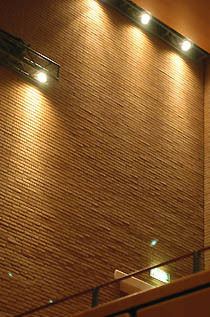 This shows in, for example, the deliberately uneven brick work on the walls at the front and back of the middle hall, with different sound-absorbing properties than a smooth brick wall would have. 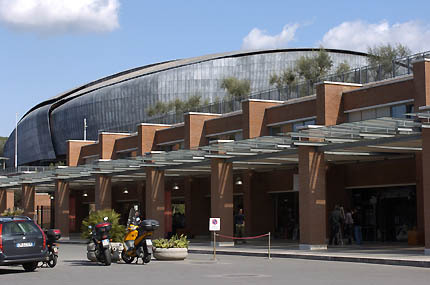 From Rome's train station, take bus number 910. This will take you close to the auditorium; you have to walk along the fence to find the main entrance. Alternatively, to take Metro Line A to Flaminio, and change onto the train to Euclide (one stop). From the northwest corner of the Piazza Euclide, head up Via G. Del Monte, cross the main road diagonally and continue along Via G. Gaudini. You will pass the Music Boxes on your left; immediately beyond them, turn left down Viale P. De Coubert to find the entrance. The complex is open daily 10am - 6pm. Entrance is free. Paid-for guided tours are also available irregularly. 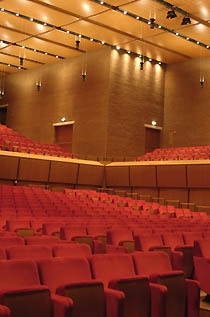 For more information please visit www.auditoriumroma.com (with an English option) or call +39 06 80 242. 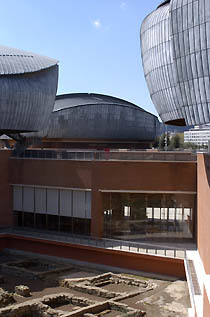 While in the area, you may be interested to visit the Palazzetto dello Sport by Pier Luigi Nervi across the road from the auditorium.